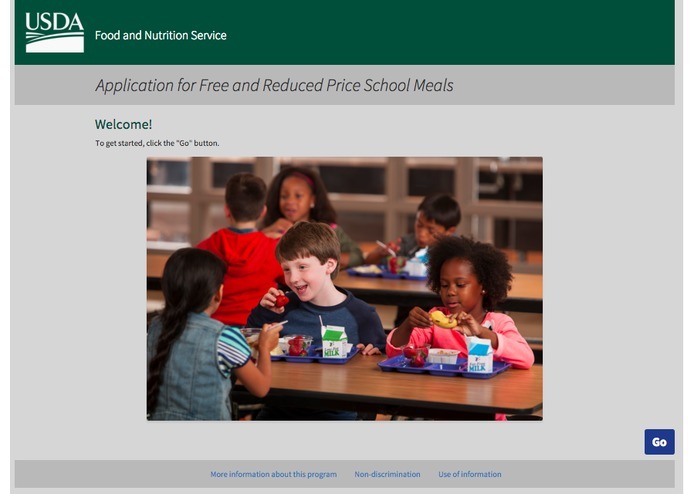 The paper-based form for the USDA Food and Nutrition Service's National School Lunch Program and School Breakfast Program used to be as complicated as a tax return. An audit of the program revealed an astonishing amount of errors in form submissions and over $600 billion dollars in erroneous payments. The paper form was revised with a User-Centered Design approach, resulting in a simple 1-page document. We wanted to do the same thing with this online form. This online form is a single-page web app that asks a series of questions to collect the required information. To begin, I built a simple prototype of the application using Axure (that my first time using the software, and I love it!). This gave me a way to test out my idea of using a series of questions to build a "Lunch App Wizard." I shared the link with my classmates and coworkers and collected feedback. I continued to improve the Axure prototype, incorporating suggestions and fixing errors as my users reported their test results. Want to see the prototype? (The password is "JMUux"). Andrew jumped in at that point and Bootstrap-ed my Axure prototype. Armed with a working mockup of the user interface, we charged into complete more usability testing. We adjusted colors, layout, and question types based on what we learned. After that, I got to the hard stuff...coding. Oh, man, so much! This was one giant logic puzzle. Relying on my experience as an ELL teacher, I constantly refined the language to make it as simple and as user-friendly as possible. Internationalize the form with i18n! More guidance and help text, customized user prompts, and a progress bar. Try to run it on a mobile device without Internet access using Cordova. Add user accounts to let school districts access the data with Meteor Accounts. I helped to design and test the interface and user experience of our application. Building this involved creating wireframes and mockups, and developing a front-end with Bootstrap. In addition, I helped to test the user experience of our application with page design tests and user research.